I'll admit it, this was simply swiped from Ectomo, which is sort of like collecting low-hanging fruit for cephalopod-centric ephemera. But look how amazing it is!! 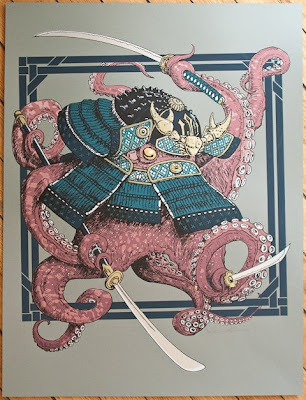 Chicago artist Phineas X. Jones has made prints of a feudal Japanese octopus! 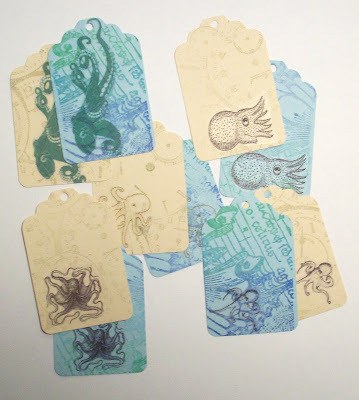 And that's only the tip of the iceberg of the wonderfully tentacley things you'll find on his screen-print site. 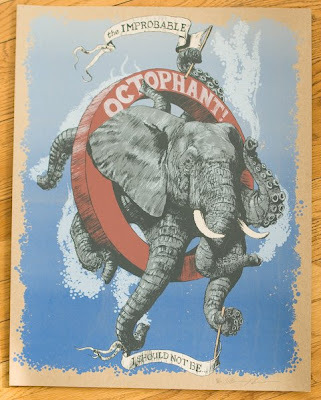 Witness the improbable Octophant! Alas, if only it weren't sold out. Find even more exciting imagery from Phineas on Flickr. The trouble with today's remote-controlled subs, says Cecilia Laschi of the Italian Institute of Technology in Genoa, is that their large hulls and clunky robot arms cannot reach into the nooks and crannies of coral reefs or the rock formations on ocean floors. That means they are unable to photograph objects in these places or pick up samples for analysis. And that's a major drawback for oceanographers hunting for signs of climate change in the oceans and on coral reefs. "So we are replicating the muscular structure of an octopus by making a robot with no rigid structure - and that is completely new to robotics," she says. While many of you were drinking green beer, wearing stick on sparkley shamrocks and weaving home singing irish songs in fake accents (or maybe real ones) - some brave souls like Molly Friedrich, shirked the revelry of the day to take on the most important task of saving us all from the influx of Air Kraken. 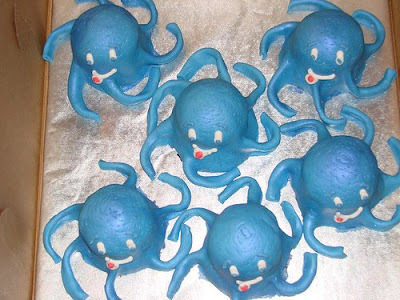 Creatures which, for reasons possibly related to the snakes being driven from Ireland, appear in great numbers on St. Patricks Day - also known, as our enterprising reporters have exlained, as Air Kraken Day. Talented artist Eric Orchard pointed me to the fantastic, whimsical art of Stef Choi. Above is her gouache and color pencil Undersea Journey. See more at her blog, including work from the early development design department on for the film based on Neil Gaiman's Coraline book. Multi-talented artist Myke Amend created this amazing "home for nocturnal flying cephalopoda." See more photos of this project at his Flickr page, and read about it at his blog. By the way, Ettadiem is the Etsy shop he shares with partner Bethalynne Bajema, and it's currently having a sale! 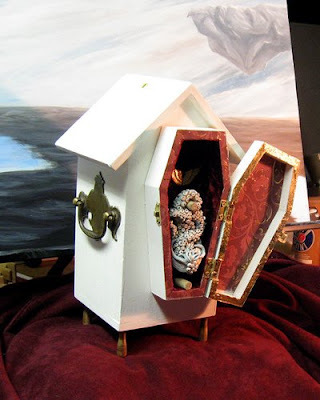 From the artist's description: Wood, brass, lacquer, polymer clay, gold leaf, crushed velvet make this birdhouse and figurine combination, which will show at The Genuine Artikle in NYC, March 28th. Bethalynne Bajema's work will also be shown at the Genuine Artikle on this date. 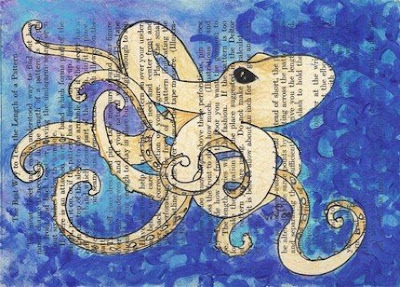 Etsy artist Emily White has several enchanting tentacled creatures in her Darkling Treasures shop, including these fun octopus tags with five different images (above), and the original mixed-media pen and ink illustration on a vintage book page (below). Visit White's blog and website for more. Some of you may be aware of the scourge of the skies - the deadly Air-Kraken. Though Sir Arthur Conan Doyle wrote of them (The Horror of the Heights), and the whole ecology supporting these sky based terrors, they seem to have been mostly forgotten about. Well, with March being the height of their mating season, it’s as good a day as any to look warily to the skies and remember the mighty Air-Kraken. 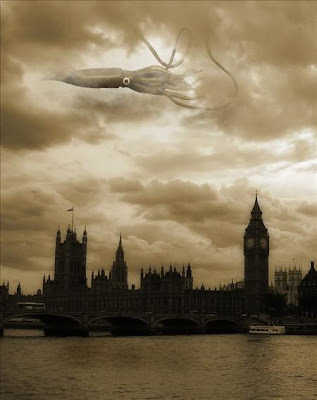 It is of course, St. Patrick’s Day also, so perhaps you’ll take a glass or two of whatever tickles your fancy, and look to the skies to see if you might by chance spot an Air-Kraken flitting between the clouds - it’s probably the very best time to do so. Current theories believe them to be either semi-transparent and made from mostly aerogels, or alternately colour-changing like water-based squid and supported aloft by sacs of hydrogen. 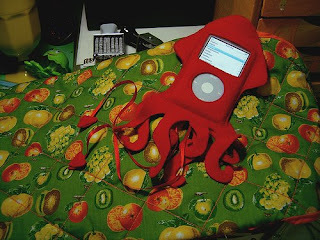 This fabulous iPod cozy was made by Flickr's crafty queenrobot, and rocks my socks. 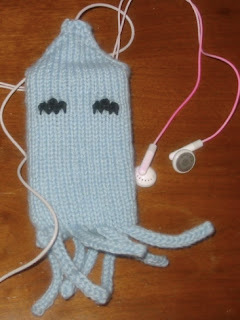 Another squid-loving option by Craftster's pinkhairedcyn. Check out her tutorial and pattern here. Art by Elise Towle Snow from her delightful Etsy shop, the Argyle Whale. From her description: The mighty kraken is on neighborhood watch and won't tolerate pirates in her waters. 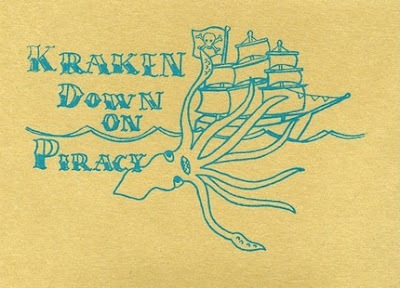 Those scurvy knaves don't stand a chance! 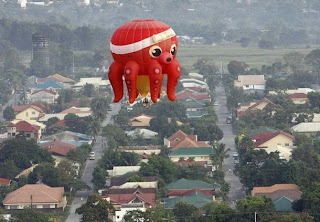 An octopus-shaped hot air balloon flies over Porac town in Pampanga province, north of Manila [on] February 7, 2008 during the 12th Philippine International Hot Air Balloon fiesta at Clark freeport, a former U.S. military facility. At least 14 countries from Europe, Asia and U.S. have participated in the four-day tourism project. I'm pleased to announce that now, someone watches this blog who is not a personal friend to one of the authors! (Well technically probably not the first, since one of the authors watched this blog without being my bestest pal or next door neighbor, but it seemed like a good intro). K.M. 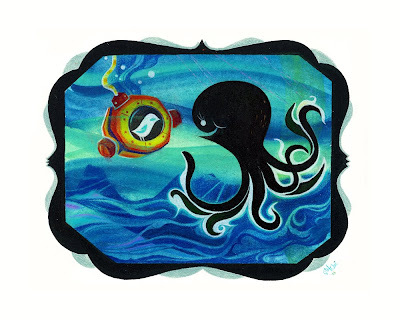 Kotulak emailed us to mention our shared love of cephalopods and link us to some of Hibernacula's most tentacley items. Check out the Etsy shop http://Hibernacula.etsy.com for more monstrous items. Thanks for the note K.M.K.! 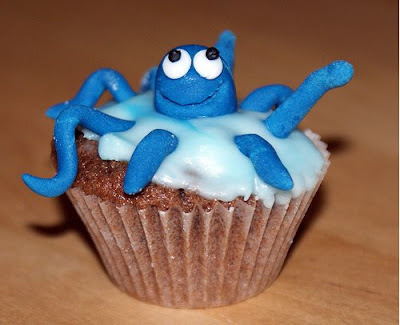 Flickr's MummyG made cupcakes with an ocean theme, including this adorable little guy. And cupcakeenvy had a different take on the same theme, but still just as sweet! Via Cupcakes Take the Cake. Art by Andrea Gutierrez of Etsy's littlebighead. I've long been enamored with OctopusMe, the jewelry designer on Etsy who casts her sterling designs from REAL sushi-grade sea creatures. She has some phenomenal new designs up... including this tie tack cast from a baby octopus. And, she's been adding gemstones to her already-stunning designs. Hold me back! 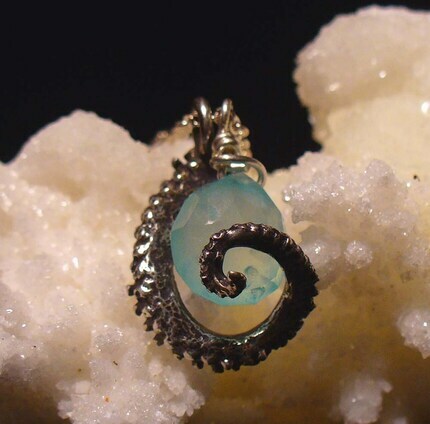 Now go drool over so much more of her astonishingly graceful work in her Etsy shop. Talented artist Suzanne Forbes turned me on to this great little store that just opened in Southern Cali: Sew L.A.. Check out owner Shaerie Raulli Mead's blog, Sew L.A. & Lovely Creature Corsetry on LiveJournal. Can't you just imagine a corset (or another project) featuring some of your favorite tentacled friends? Stop in for the grand opening celebration on Saturday, 14 March, between 5-9P. Snacks, drinks, schmoozing, oohing and ahhing...and a drawing for two $50 gift certificates! If you're not in the area, you can still keep an eye on happenings by joining the Sew L.A. fan page on Facebook here. P.S. 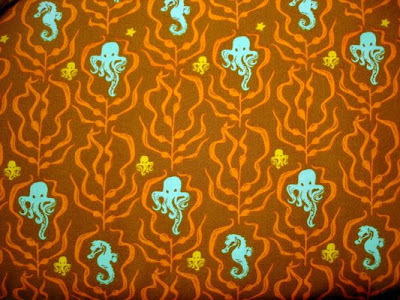 Shaerie, if you find any cuttlefish fabric, let me know! 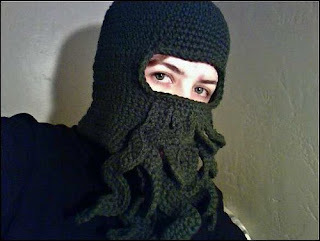 Crocheted Cthulhu beard hat (or balaclava, whichever you prefer), by Flickr's quasi_angel2000 (the pattern is posted on Ravelry). 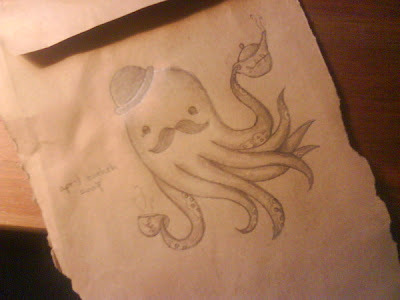 I like a crafty & curious octopus.